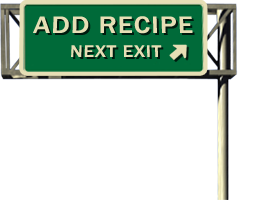 Those of you who read my recipes probably know by now that I love Trader Joe's and visit their store whenever we are near one. On our last trip to Albuquerque we purchased a frozen polenta and mixed vegetable dinner that we loved so much I decided to create my own. This was mostly out of necessity because the nearest Trader Joe's is currently 300 miles away. 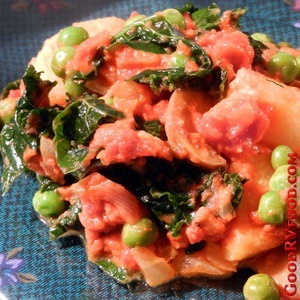 This easy vegetarian dish is now part of my favorite valentines by candle light romantic dinner. I serve it with a salad, rustic bread and a nice glass of my favorite wine. The Creamy Tomato Vodka Sauce is the real secret to this dish. It is very different from a marinara style tomato sauce. Most grocery stores carry at least one band of this. We really like the one from Costco. Originally I wanted to use Rachel Ray's You Won't Be Single For Long Vodka Cream Pasta that has the famous reputation of being so good it causes people to fall in love. Since I'm already in love it was a lot easier to buy the vodka cream sauce and have more time with my sweetie. This recipe for two only needs about half a jar of the sauce. Save the rest for a nice pasta meal the next day. I use the remaining polenta for breakfast with some scrambled eggs. You can use any greens you like, either fresh or frozen. If frozen just cook them in the pan until they are warm. If you prefer fresh mushrooms by all means use those. Most of these ingredients can be kept in your pantry or found at any local grocery store. The polenta when you buy it in the roll does not need to be refrigerated until after it is opened. You will need a skillet with a lid for cooking and a bowl to hold the ingredients as they are cooked in stages to build up the flavors. Heat olive oil in a skillet over medium heat and sauté diced onions and sauté just until translucent. Remove to a bowl leaving the flavored oil in the pan. Slice the Polenta into rounds about half an inch thick, cook each side of the polenta slices until heated through and slightly browned on the ends. Cut each polenta slice into quarters and remove to the bowl. Sauté the mushrooms until lightly browned. Remove to bowl and cover. Cook chopped leafy greens stirring occasionally until slightly softened. Add a little water, cover and steam until the tenderness you prefer. Uncover the pan and let most of the water evaporate before adding the sauce with the rest of the ingredients and heat through. Add a handful of frozen peas and heat just until they are warm. Goes very well with garlic bread.